Eagles’ Nest is cradled in a secluded valley high up on the slopes of the historic Constantia mountain range, which forms part of the World Heritage Site, Table Mountain. The farm’s origins can be traced back to 1836 when it was used as a refreshment station between the area now known as Wynberg in the east, and the harbour of Hout Bay in the west. In order to make this journey, travelers had to cross the mountain pass, now known as Constantia Neck. In 1984, the 38ha farm was purchased by the Mylrea family. Eagles’ Nest vineyards were established after the devastating fire in 2000 destroyed the fynbos and natural vegetation on the farm, as well as 95% of the forestation. Amazingly the historic buildings on the farm were saved, and being part of the world famous Constantia Valley, known for its award winning wines, it was decided to plant the farm with varieties that best suited the unique terroir of Eagles’ Nest. Eagles’ Nest is situated less than 15km from False Bay on the Cape Peninsula and the vineyards rise from 140m to 406m above sea level, making them some of the steepest in the country. The vineyards face north, east and west and therefore there are very long sunlight hours during the growing season, but critically the cool sunlight hours of the late afternoon, which are so important for phenolic ripeness. The mountain ridge running along the west side has an annual rainfall of ± 1200mm, mainly in winter, supported by an abundance of underground water, dam and natural springs. All vineyards are irrigated to manage plant stress through the dry summer months. The geographic layout provides good sunlight exposure with relatively cool days for a warm, Mediterranean climate. The soil types on the farm take predominantly two forms: decomposed granite and clay – ideal for Merlot – and very rocky Table Mountain sandstone, where the Shiraz is grown. Viognier is grown in slightly richer more loamy soil type. At Eagles Nest they believe that wine making starts in the vineyard. Primarily with root stock and clone selection, secondly with individual block and vine management and finally, with fastidious disease control. The vineyards are maintained by hand throughout the year. Eagles’ Nest is planted predominantly to Shiraz, Merlot and Viognier. 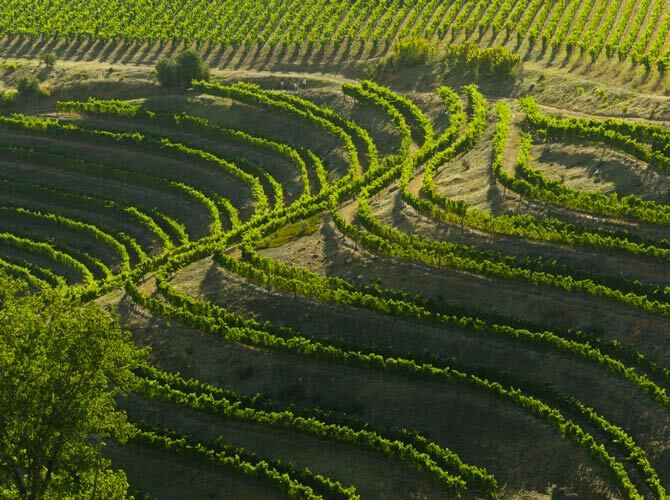 The decision to plant these grape varieties was done after extensive soil and climatic research to ensure that what was planted was best suited to the unique terroir. The vineyards are planted on some of the steepest agricultural slopes in South Africa and therefore at Eagles Nest they make use of a unique terracing system to maximize the sunlight hours the vines receive. The origin of the name that graces the estate is lost in the mists of time, but the survey beacon situated on the cliffs that rise up above the vineyards is labelled Eagles Nest. This could indicate that these crags once housed a breeding pair of Eagles. If this was so, it is most likely that they would have been a pair of Black Eagles, now more correctly known as Verreaux’s Eagles (aquila verreauxii). This wine exhibits a beautiful clear, almost platinum hue. The nose shows primary Sauvignon Blanc fruit aromas of passion-fruit, pineapples and guavas. The palate is fresh, with a lively acidity and the tropical fruit aromas carrying through. The soft, elegant mouth-feel and focused acidity suggest this wine will be ideally paired with sushi, grilled fish and shell fish. This vintage shows a touch more complexity than its predecessor, taking full advantage of more mature vines. Meticulous attention in the vineyard and cellar combine to produce a wine that’s nose is a textured array if gorgeous ripe berry fruit, complemented by nuanced baking spice and crushed pepper. The fruit is vibrant, complex and pleasantly focused by bright acidity. On the palate the delicious dark berry fruit of the nose is carried through to the taste buds and they combine harmoniously to give a rewarding taste sensation. Flavours are supported by juicy tannins and extend into a persistent aftertase. As a result of the incorporation of some new (500L) barrels, this wine is slightly bolder than its predecessors. The nose shows enticing aromas of fresh ripe mandarin skin, orange blossom and white pear. When allowed to stand in the glass beautiful perfumed notes of jasmine flower emerge (classically identifying it as Eagles Nest.) A fresh, rich mouth filling palate, quince preserve like characters and tell-tale Viognier spices entice and engage the senses. Positive freshness (suggest longevity) coupled with even handed wooding ensure a crisp clean finish and lingering after taste. Wonderful cool climate character with elegance from the Eagles Nest stable this wine is rich and bold without an excessively high alcohol. Meticulous attention in the vineyard and cellar combine to produce a wine that’s nose is a textured array of gorgeous ripe berry fruit, complemented with dark chocolate nuances and a linear crushed pepper component that is a unique to the grapes from these slopes. On the palate the delicious dark berry fruit of the nose is carried through to the taste buds and they combine harmoniously to give a rewarding taste sensation. Flavours are supported by ripe juicy tannins which leave a long silky-smooth finish.